I co-led a team of 7 designers through a Customer Development Sprint and a Google Ventures Design Sprint that resulted in the delivery of a high fidelity, user tested prototype. The prototype achieved our team's desired outcomes and ROVR is now building out the design we created. ROVR is a seed stage startup currently valued at $4.3 million. They are creating a platform that allows people to create and take tours on their mobile phones. By capturing audio, photographs, and text and using geolocation to drop a pin where the content was created, people can create tours on the go, and anyone can access their point of view by following in their footsteps. I was co-lead on the project, in charge of everything from defining the strategy and scope of our work, to orchestrating successful meetings with the client, and leading our team of 7 designers towards achieving our goal. Our goal was to deliver a stellar, usability tested, mobile prototype to ROVR so that their engineers could build out the first version of their app. We broke our work into 2 week sprints. As ROVR had yet to nail down their exact target audience, in our first sprint we ran a lean experiment focused on customer development. 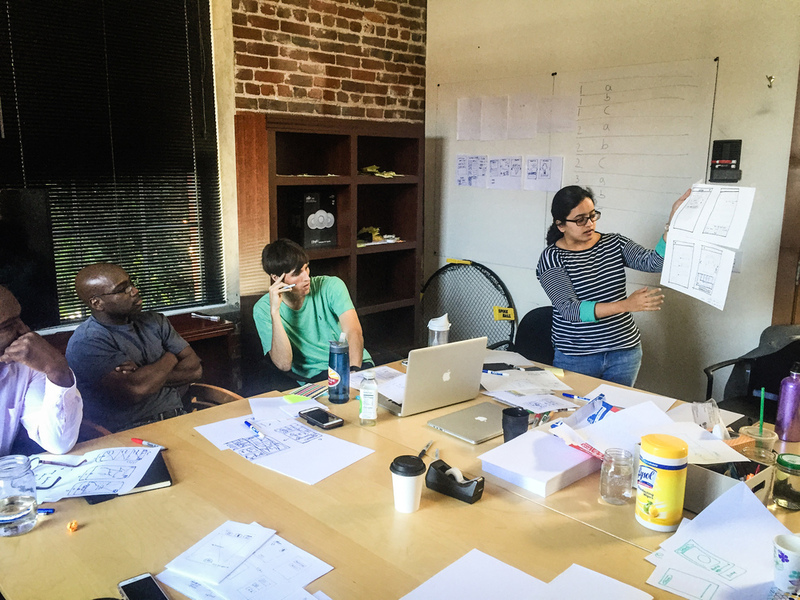 After this learning, we ran a Google Ventures style design sprint to build out the UI. Inception: When we first met with ROVR, their target audience was relatively broad. As a firm believer in building an incredible product for a small group of early users, I felt it was critical to know who exactly we were creating for. I led a meeting between our design team and ROVR's CEO, VP of Engineering, and Director of Business Development, in which we formed a hypothesis about who our specific target users might be. We used this information to create a provisional persona and then ran an experiment on people who matched it. The Experiment: We reached out to people who fit the persona for interviews. At the end of each interview, we offered to personally create a tour for the participant if they sent us the necessary information. We hypothesized that if 30% of those surveyed decided to create their own tour after learning about Rovr, we had found a promising target audience for the platform. If less than 30% took the opportunity to create a tour, we would either have to offer a greater incentive, or find a new target audience. This was never meant to be hard science. Utilizing this framework was simply a way for us to make our qualitative learnings more concrete. Whether we succeeded or failed, our interviews combined with our test would teach us a lot about what motivates people to create tours and how we can build an app around their needs. The Results: Only 1/10 participants interviewed was motivated enough to actually create a tour. This was actually great news. Instead of ROVR building an entire product for a group of people who didn't want it, they were able to use what we learned to pivot in a better direction! We also learned that we had been highly underestimating the cognitive load necessary to create a tour. If we want people to be tour creators, we need to reduce effort necessary to create one. This ended up resulting in a fundamental shift when designing our UI. What I Learned: Experiments are the best way to learn. Almost every person we interviewed seemed excited about our idea when we told them about it at the end of the interview, yet almost no one actually took the time to create a tour! In defining a binary pass/fail condition for the experiment, we forced ourselves to create a task that went beyond simply saying you were interested--people had to show it. 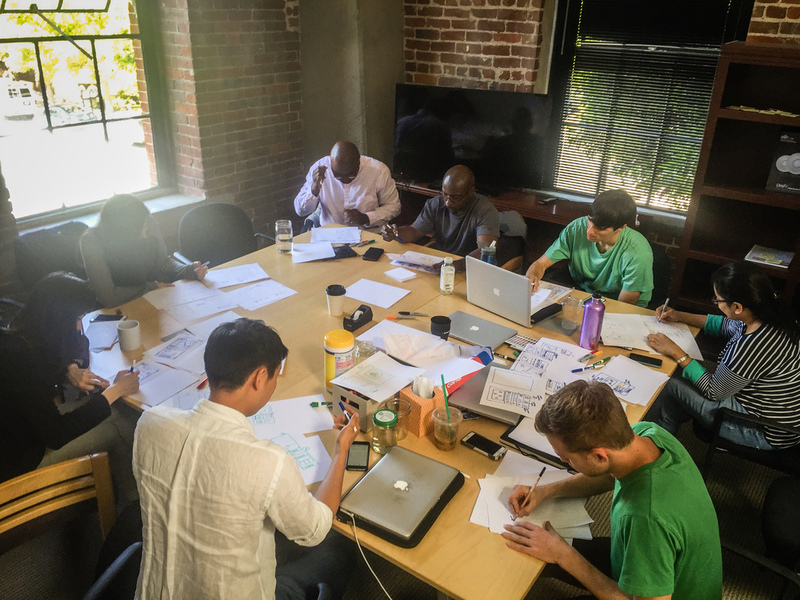 Inception: At Tradecraft, our design team recently got the pleasure of meeting with Daniel Burka of Google Ventures. He got us incredibly excited about the GV Design Sprints they're doing over at Google, and the value of sprinting to prototype so you can user test as early as possible. He gave us some incredible tips for doing a sprint of our own, and we decided to run one of our own for the Mobile Design portion of our work with ROVR. Step One - Understand: We began by going over all of ROVR's learning up until this point and all that we had gleaned during our prior customer development sprint. This gave us a solid foundation for future design. Step Two - Diverge: We kicked off the process with a 4 hour meeting in which every person on the team, including the CEO, VP of Engineering, and Director of Business Development at ROVR, sketched out their idea of what the UI and flows for taking and creating tours might look like. We tacked all of our sketches to the wall and gave everyone two blue dots they could use to vote for the design they liked best. The idea here was to diverge, minimize group think, and maximize individual creativity. Then, after a wealth of possibilities had been individually created, we discussed as a group and took the best elements from each design. Step 3 - Decide: In a classic GV Design sprint, you only have one week, not two, and at this stage you decide on a single prototype to build out and test. We decided to take it a step further, and chose to build out the two most promising prototypes from our session. The plan was to user test each prototype, use the learnings to decide on a victor, and then take the best elements from each to create one, super prototype. This is a twist on the classic GV Design Sprint, inspired by the diverging/converging spirit of the GV Design process. Step 4 - Build: We broke up into two groups, each tacking one of the flows and building on the UI sketches we had created. By mocking up in Sketch and prototyping in Marvel and Keynote, we were able to build out both prototypes in a single weekend. During the process, I continually kept returning to one of the ideas we had left on the wall - a version of the app that emphasized the quick creation of individual points and centered around a map-based interface. My curiosity got the better of me and at 8PM, the night before we we're set to present our two prototypes to the ROVR team, I decided to embark on exploring a third. I quickly became excited by advantages it presented, and by leveraging the work we did on the other two prototypes, I was able to create a third in only 11 hours, finishing at 7AM and heading straight in for our meeting. Step 5 - Validate: We ran a total of 27 tests on our prototypes, 9 a piece. The map-centered interface I created ended up emerging as the clear victor. Creating three different prototypes gave us tremendous clarity. By diverging into separate groups, we all come up with unique solutions to the myriad of problems we faced during the design process. It was a blast to come together and see how each team had tackled these problems differently. Ultimately, ROVR wanted one prototype to hand off to their engineers, not three, so our next step was to analyze our usability tests, see which solutions worked best in each design, and mesh them together to create one final prototype. The map-centered design tested by far the best with our users, so we used that as a base, and then pulled in the successful elements of the other designs. Step 7 - Validate Again: We ran another round of usability tests on the final prototype to ensure the final model we delivered achieved our goals. Significant progress was made. Still, there was a myriad of improvements that were tempting to implement. Getting into a fast feedback loop of testing and iterating can be addictive-we wanted to keep going. Unfortunately, our 2 week sprint was over and it was time to deliver our final version to ROVR. We presented them with what we had, along with a set of recommendations for further iterating going forward. Step 8 - Feedback and Retro: The feedback we received from the ROVR team was incredibly rewarding. The Google Ventures Design Sprint is an incredible framework for tackling design problems. Diverging to think individually, and then converging to select the best design solutions is a powerful way to generate ideas and come to consensus. By taking this divergent/convergent methodology a step further into the prototyping phase, we were able to come up with radically different design solutions and actually test them with real people. This feedback allowed for the best elements of each design to eventually be incorporated into our final solution. It's critical to follow your excitement and go the extra mile to build out the ideas you're excited about. Using Sketch/Marvel/Keynote, you can quickly turn ideas into hi-fi reality.